Dubai /Abu Dhabi: Bishop Paul Hinder, 76, has been the Roman Catholic Bishop in the UAE for 15 years. The Swiss prelate joined the Franciscan Capuchin Order in 1962, was ordained a priest in 1967 and obtained his Doctorate in Theology in 1976. Bishop Paul is a member of the Pontifical Council for the Pastoral Care of Migrants and Itinerant Peoples, a consultor to the Congregation for the Evangelisation of Peoples and the Pontifical Council for Interreligious Dialogue. He is also a member of the Conference of the Latin Bishops of the Arab Regions. 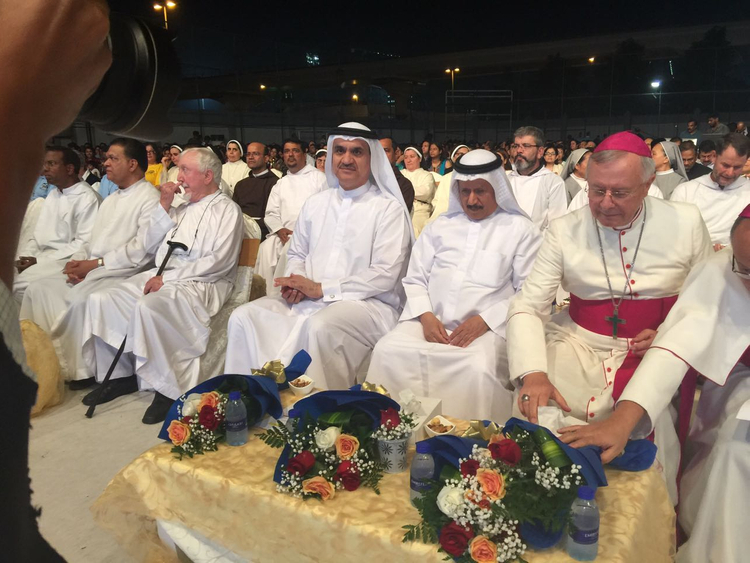 He is the current Vicar Apostolic in the Apostolic Vicariate of Southern Arabia and is based in Abu Dhabi. Below is an interview with Gulf News he granted via email on the occasion of the World Tolerance Day. 1. The United Arab Emirates is the home of immigrants from all over the world. How long had you been a pastor for Catholics in the Emirates? What is your own personal experience when it comes to tolerance here? As Bishop, I have been living here in the country for almost 15 years as the Bishop of all the Catholics – the first six years for the Catholics in the whole peninsula except Kuwait, and since 2011 for the Catholics in the southern countries – UAE, Oman and Yemen. As for my personal experience regarding the policy of tolerance – I have to say that I have felt welcome and respected – not only tolerated! That has been a very good experience for me – be it among the locals, with whom I had to deal with extensively or be it also with other people, the Christians and non-Christians who are living in this country. Of course, I experience the reality of being a foreigner – I still am a foreigner; but every passing year, I have felt more at home and I think this has to do with being accepted, being respected. 2. It is quite rare anywhere else in the world where scheduled masses are said in so many languages — especially during festivities observed by the Church – which is the case in the UAE. Is it correct that on days like Christmas or Easter, Catholic Churches in the UAE celebrate masses in multiple languages: French, Italian, German, Arabic, Telugu, Hindi, Malayalam, Tagalog, and English (any other languages I’ve missed?). Isn’t this a generous sign of tolerance in the UAE? The life of the Church is, of course, very rich – it has to do with the multi-nationality of the church – the different traditions, the different mentalities - which can sometimes also turn into a stress situation for the Bishop. On the other hand, it gives me the experience of a true “catholicity” of the church – where we have to live our common spirit despite our different origins, different cultures and different experiences which we may bring from back home, from where our people come. Of course, here, the Church is typically marked by a strong Asian style because the majority of our Catholics are either Filipinos or Indians. There are also the Arabs from the states where there have been Arab-speaking Christians since a long time and then we have people from all over the world – there are Africans, there are Europeans, there are Americans, there are Koreans, and so on. For someone who looks from outside, it is an experience, one could say, like the Pope speaking from St. Peter’s Square “Urbi et Orbi” – to the city, to the whole world – we have this experience here. This is why especially on the big feasts, we have here in Abu Dhabi and Dubai the liturgies in so many different languages – besides the languages you have listed – also Polish, Spanish, Portuguese, Konkani, Tamil, and so on – we could list more. I would say that it reveals the multi-nationality and riches of the Catholic church – the universal nature of our church which is truly present here in this part of the world. 3. Multiple communities (about 200 nationalities) are present in the UAE, living in peace with each other. Catholics here are a vibrant community, comprised by many tongues and tribes. Our churches built on land given by the different rulers. St Mary’s Dubai just marked 50 years in Dubai, a Muslim state. There are many Catholic-run schools in the UAE with thousands of students, and where different communities (including non-Catholics/Christians) are also welcome…What do you think are the lessons other countries can take from this UAE experience and practice of tolerance? This multinationality and so on – that we are living together in peace, that we have schools which are also value based, where we have not only Christians, but also non-Christians – both Muslims and those from other religions – these are schools where we learn to live together with others belonging to different religious convictions in mutual respect. And that is one of the missions of these schools. I think this is also one of the missions of this country, and in so far, we can say that we can teach this to others. But it is always difficult to say “we are teaching others” – I would say that we are living a reality; and other peoples, or other countries of the world may learn in a certain sense from our experience, but each nationality or each nation has to do this in its own way, but we can always enrich each other. Of course, we are here in the UAE, and in most of the emirates we are privileged compared to other states in the region, or compared to other parts of the world. 4. In certain countries in the West, hatred against the 'other' is a rising concern. And hatred is usually triggered by ignorance or simply by the fact that the object of hatred belongs to another 'alien' race or culture. What explains this phenomenon? What is your message to western governments and communities where such sense of xenophobia rears its ugly head. What should be the attitude of the Western communities towards the forces of intolerance? Regarding the foreigner or the one who comes from outside, I think we have to be careful that we do not generalise or make pictures which may not fully correspond to reality. We are not living here in the Middle East in a peaceful world – we can see that hatred is possible also in these countries – we have only to look at Yemen, or at Syria, Iraq or Afghanistan. We are happy and grateful that we are living here in the UAE where, fortunately, we do not have this situation, and this surely makes a great difference. Regarding intolerance, if I look back at my home country (Switzerland) and the countries which are surrounding us in Europe, of course there is a growing movement right now which is concerned about too many foreigners who are entering these countries. I would say that this is not only a question of Muslims, but a question of foreigners in general. It is true that there is such a rising movement. But on the other hand, we have to say that in all these countries, hundreds of thousands (if not millions) have been integrated during the past years and given citizenship, which is also something that we do not see here that often. We should be careful not to form prejudices. Having said that, without any doubt, the policy of this country can give us a model how to live with foreigners in peace; but we also know...there are clear limits, and it helps also, of course to maintain the peace and stability which we experience – things probably would not work if it were not this way.